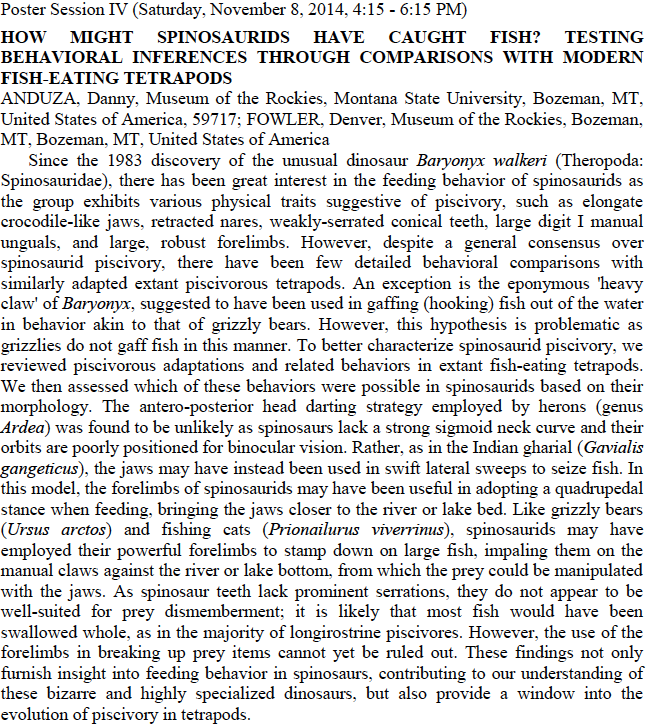 More to come for sure in many future posts but I just wanted to leave this here: an abstract for the Berlin SVP meeting looking at Spinosaurid behavioral ecology through the lens of extant fish eating tetrapods. I concur with some thoughts - lack of a strong signal for heron type stalking - and disagree with other thoughts - the use of the claws for "pinning" prey against the substrate as their primary role. I don't think ANYONE ever proposed that spinosaurids darted their head heron-fashion. This is a strawman rejection. The "heron" part of the model was simply the "wading out and grasping prey with jaws" model, which is not rejected. Thanks for commenting Dr. Holtz. Good clarification. I did not mean to insinuate that the "darting neck model" as part of the larger "heron model" of foraging for spinosaurids has become accepted or ever even proposed. What I do take issue with and what in upcoming posts I will argue is that of the possible wading predator models we have to choose from among extant tetrapods herons are not the best. I will argue that a tacticle foraging strategy (as supported by sensory pits and weak binocular vision) deemphasizing visual detection works best. And among extant wading predators I argue that certain storks/spoonbills fit this analogy most strongly. But unlike wading storks and spoonbills I will offer that spinosaurids often times completely submerged most of their body in order to forage in deeper waters after larger fish. This method also allows the arms to increase the feeding envelop for prey detection and would be held in a manner not unlike some stalking insects (mantids). Of course this does not preclude shallow water hunting foraging. Indeed I think spinosaurids would be adept at finding and exploiting fish trapped in seasonally drying pools. Spinosaurus aegyptiacus took these baseline adaptations to the extreme in my opinion - to the point where terrestrial capabilities were being diminished.